This workshop will examine reading and written language disorders from a brain-based educational perspective, and classify both dyslexia and dysgraphia into distinct subtypes. There will be a detailed discussion linking each learning disorder’s subtype with scores of evidence-based interventions. Four universal truths when teaching reading will be shared, in addition to five essential steps for effective written language instruction. The use of neuropsychological assessment addressing multiple cognitive constructs that underscore literacy will be featured. For instance, the role of phonological processing, orthographic processing, working memory, language and motor skill development, and executive functioning will be discussed as being crucial for effective literacy skills to emerge. Lastly, the “90-minute” learning disorders evaluation highlighting the Feifer Assessment of Reading (FAR) battery will be introduced as a more effective means to both identify and remediate language-based learning disabilities in children. 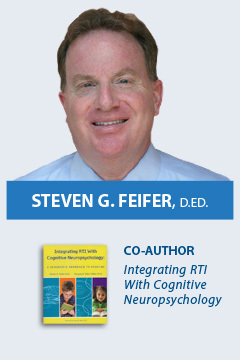 Steven G. Feifer, D.Ed., ABSNP is an internationally renowned speaker and author in the field of learning disabilities, and has authored seven books on learning and emotional disorders in children. He was voted the Maryland School Psychologist of the Year in 2008, and awarded the 2009 National School Psychologist of the Year. Dr. Feifer is a licensed psychologist currently employed at the Monocacy Neurodevelopmental Center in Frederick, MD, and also teaches in the ABSNP neuropsychology training program, as well as consults with numerous school districts. Dr. Feifer has authored two tests on diagnosing learning disabilities in children.